"we ben fishining arrown the N 8 57 W 84 26 today that blue water was all the way into the N 9 10 W 84 35 just 30 mile from the marina we was 12 for 20 with sailfish broke off a leader with a big blue after fighting the fish for ten minute those guy had a great time "
John Boy Replies: "We don't call him Pokey for nuthin"
Triggers and Snappers: Switched to some little hooks and worked on these nice triggers. Yum, yum. Still seeing a lot of fish, but they're lazy, lots of bait also. We're still getting what we need, everyone is getting a turn or two. Very cool stuff. 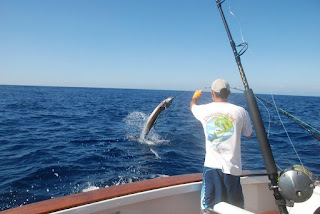 Actually, we've caught a blue one every day for the past 3 days and about 10 sails/day. ......get me on the boat trying to hook sailfish. Up until today, the guys on the Dragin Fly caught 66 sails in the last 4 days....I got on the boat today and screwed up the hook up ratio, we caught 6 for 19 bites.....and a couple dorado. Saw a blue one. Good fishing, averaging better than 10 sails/day for the last week. 19 yesterday with a tuna and dolphin for dinner. Dragin Fly is getting just what we need, 1 or 2 sails/customer/day.....today some guys had a 3rd turn with 10 releases today.